Thanks everyone for the heartfelt comments on yesterday's post. I really appreciate everyone's input. One comment struck me that a reader added to the discussion and said she doesn't comment anymore because she reads blogs on her ipad and she hates to type on it. I am with you on that. The ipad is so convenient for browsing but give me a keyboard anyday so I can bang away quickly on it. I think I am guilty of the same. If I am ordering anything on-line, I do it on my computer. No patience for that little screen keyboard (just saying Apple). Now that Julia is back to school and on the bus very early, I've had a chance to go outside and experience the glorious autumn early morning light. 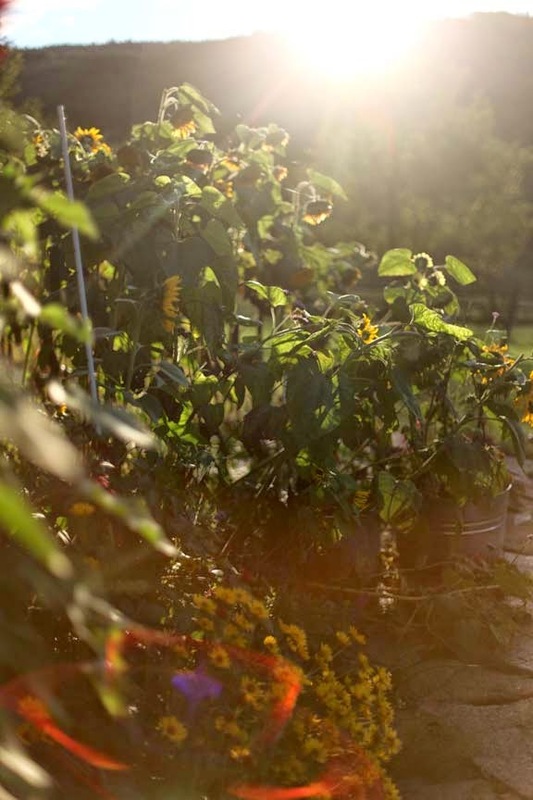 I love this time of year when the sun starts getting at a lower angle in the sky. The beautiful natural colors start taking on that gorgeous autumn glow. Here is one of the little sheds that I have surrounded with hostas. It is filled with some odds and ends. It was Julia's playhouse when she was little but now is a catchall. Every morning the light is just spectacular around it and the hosta blooms dance in the air. The photo doesn't do it justice. Do you remember when I painted my studio door this crazy bright yellow color? I love it. So cheerful. 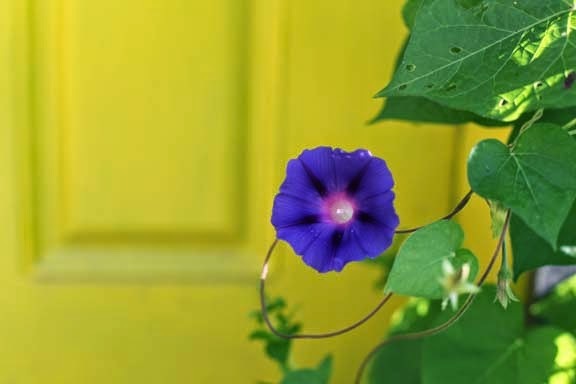 This year, I planted morning glories on both sides of the door. They are growing haphazardly around the door along strings. Every few days I have to rein them into the string set up. I think I will do this every year. I love how the dark blue of the Grandpa Ott morning glory bounces off the yellow color. 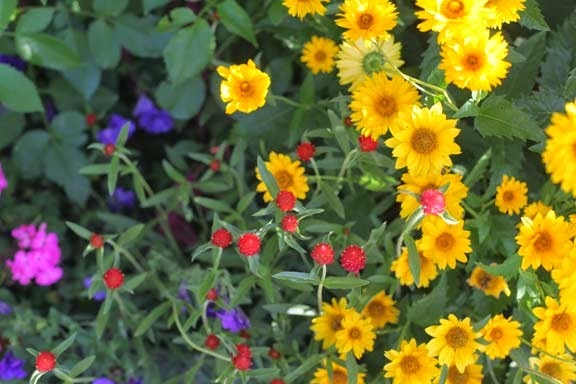 Here is a jumble of color in the little garden outside the studio. 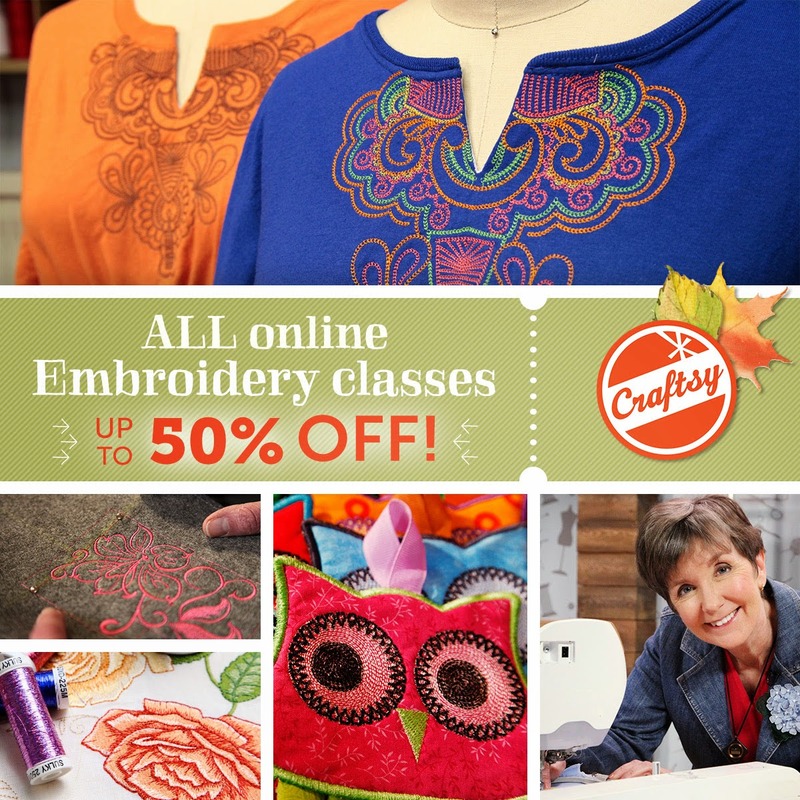 Craftsy is a great organization for me to be affiliated with. Not only are their classes stellar but they give me the opportunity to earn some extra money by helping them promote their classes. I am very thankful for that opportunity because I have learned so much from the different classes I have watched. So know that by clicking my link, you are also helping me to support my family with a bit of extra revenue. And you get to learn something too. Thanks everyone again for your kind words and encouragement on the blog. HERE IS THE CRAFTSY LINK AGAIN! you need a tip jar on your site. When something inspires a reader, pop a couple of $$ in the jar. I would do it. Beautiful photos, Kristin. Isn't the name Morning Glory just perfect? 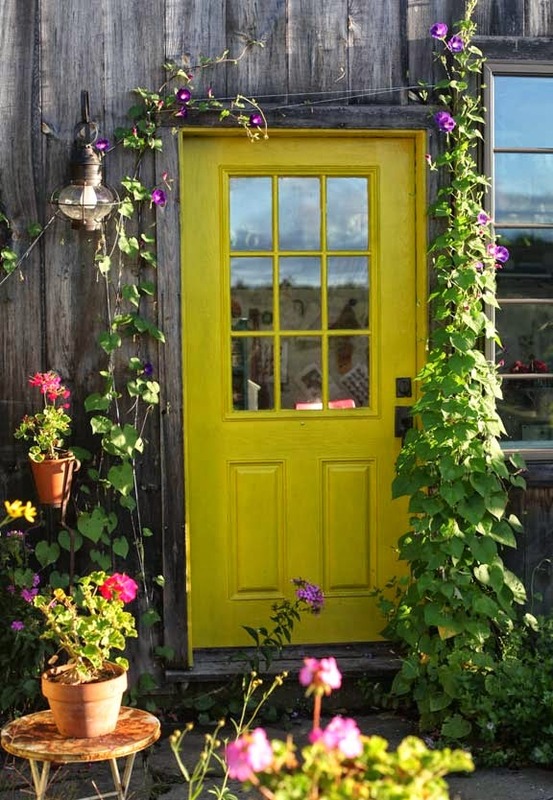 I do love that bright yellow door with the gorgeous "Glories" blooming in front of it. I will click on the link after I've left this comment so you KNOW how much I enjoy your blog! Blessings! Have a great day!! 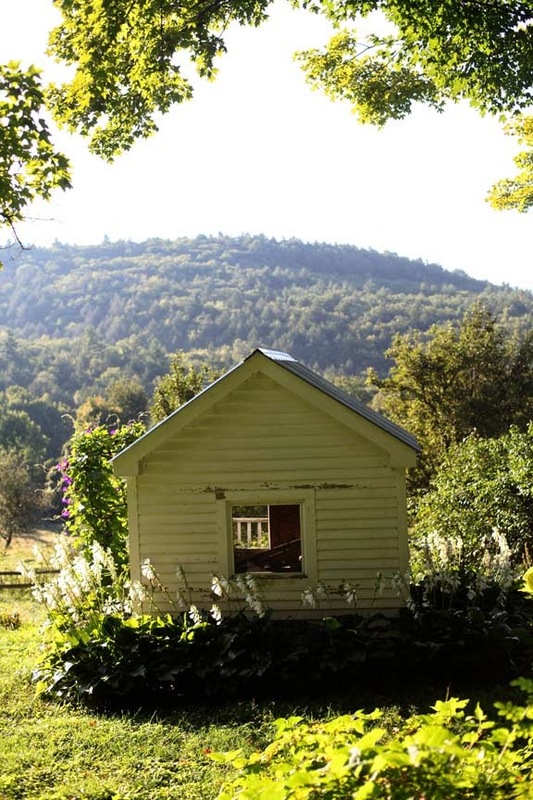 When we downsized and moved from our three acre antique house abode, the one thing we moved to our one third acre backyard was our grand daughter's playhouse!!! She is 12. I plan to decorate it with fun paint and real flowers next year....for part of my scenery! !